Released June 25, 1932 (Sound - two reels). 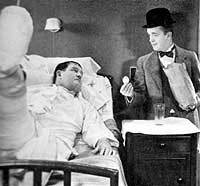 Thanks to Stan's clumsiness, a recuperating Ollie is forced to leave his hospital bed prematurely. While waiting for Ollie to be discharged, Stan accidentally injects himself with a sedative filled needle. With Stan driving, the ride home is quite an experience. Copyright ©1996-2011 Way Out West.